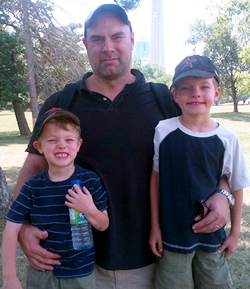 Michael with sons Nicholas and Linden. I’ve had the pleasure of being a Registered Massage Therapist here at Bruce Street Family Chiropractic since the year 2000. Over this span, I’ve met a lot of really tremendous people and have treated a vast array of injuries and conditions. My philosophy is to provide regular care to clients in order to treat and prevent injuries, subdue chronic pain, and chase the physical manifestations of stress. New clients are always welcome. Call (519) 239-3692 for an appointment. Available Monday – Friday. I’m pleased to be a part of the team at the Bruce Street Family Chiropractic. I have been practicing since 2006 in multi disciplinary settings. I graduated from CCMH in Kitchener with Honours, but the real education I have obtained has been treating clients over the last decade. I wouldn’t say I specialize in a particular type of therapy, but my style may be described as deep tissue. The majority of my clients present with repetitive strain, sports injuries, migraines, sciatic nerve dysfunction and stress. I think it’s as simple as listening to what your client is telling you, and providing them with the appropriate treatment to heal.